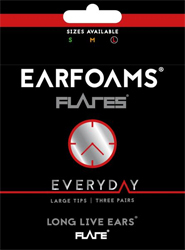 Flare Audio Everyday Replacement Earfoams are memory foam replacement ear tips for the full line of Flares earphones (including the JET 1 and JET 2). 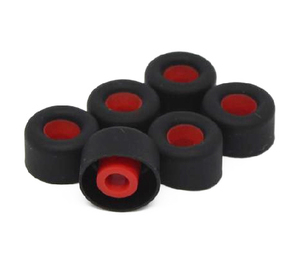 Unlike the other Flare replacement earfoams, these ear tips are made of soft, flexible silicone material. These single-flanged ear plugs conform to the shape of the ear for a comfortable fit. The biggest benefit of these silicone earphone replacement tips is that they last a lot longer than their memory foam counterparts. Foam needs to be replaced frequently, as it loses its ability to bounce back over time, often growing stiff or dirty along the way. These silicone tips can be removed from the earphones and washed in a little warm, soapy water any time they become too waxy or dirty, allowing them to last much longer. For people who use their earphones every single day, these Everyday Earfoams are a smart choice. Everyday Earfoams are the best eartips for those who use their Flare earphones frequently on a daily basis, and who need to avoid replacing earfoams all the time. Especially recommended for working out at the gym, commuting, and other daily activities. Includes three pairs of silicone ear tips. Flare Audio Flares PRO Wireless Titanium Earphones - Free Shipping! Flare Audio Flares GOLD Wireless Bluetooth Earphones - Free Shipping!